The present invention relates to the use of a subtilase variant for removal of egg stains from laundry or from hard surfaces, where the subtilase variant comprises at least one additional amino acid residue in the active site loop (b) region from position 95 to 103 (BASBPN numbering). These subtilase variants are useful exhibiting excellent or improved wash performance on egg stains when used in e.g. cleaning or detergent compositions, including automatic dishwash compositions. The present invention also relates to novel subtilase variants, to isolated DNA sequences encoding the variants, expression vectors, host cells, and methods for producing and using the variants of the invention. Further, the present invention relates to cleaning and detergent compositions comprising the variants of the invention. 4. Asp has been inserted between positions 99 and 100, Ser in position 99 has been substituted with Ala, and Pro has been inserted between positions 217 and 218 (BASBPN numbering) . 5. Asp has been inserted between positions 99 and 100, Ser in position 99 has been substituted with Ala, and Pro has been inserted between positions 216 and 217 (BASBPN numbering) . 6. Asp has been inserted between positions 99 and 100, Ser in position 99 has been substituted with Ala, and Asp-Pro has been inserted between positions 216 and 217 (BASBPN num- bering) . Asn has been inserted between positions 42 and 43 (BASBPN numbering) . 10. Arg has been inserted between posiions 99 and 100, and Ser in position 99 has been substituted with Thr. 11. Asp has been inserted between positions 99 and 100, Ser in position 99 has been substituted with Ala, and Pro in position 131 has been substituted with Thr. The present invention also encompass use of any of the above mentioned subtilase variants in combination with any other modification to the amino acid sequence thereof. Especially combina- tions with other modifications known in the art to provide improved properties to the enzyme are envisaged. The art describes a number of subtilase variants with different improved properties and a number of those are mentioned in the "Background of the invention" section herein ( vide supra) . Those references are disclosed here as references to identify a subtilase variant, which advantageously can be combined with a subtilase variant described herein. Such combinations comprise the positions: 222 (improves oxida- tion stability) , 218 (improves thermal stability) , substitutions in the Ca-binding sites stabilizing the enzyme, e.g. 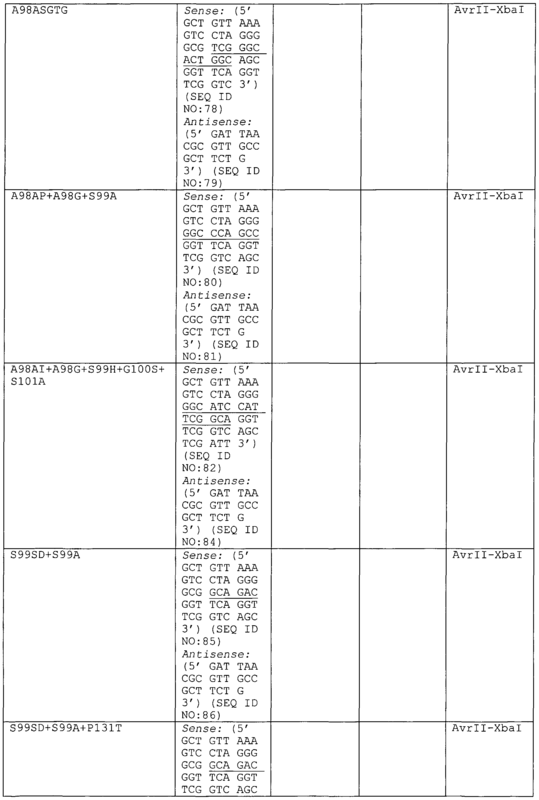 position 76, and many other apparent from the prior art. 27, 36, 56, 76, 87, 97, 101, 103, 104, 120, 123, 159, 167, 170, 206, 218, 222, 224, 232, 235, 236, 245, 248, 252 and 274. K27R, *36D, S56P, N76D, S87N, G97N, S101G, S103A, V104A, V104I, V104N, V104Y, H120D, N123S, G159D, Y167, R170, Q206E, N218S, M222S, M222A, T224S, A232V, K235L, Q236H, Q245R, N248D, N252K and T274A. 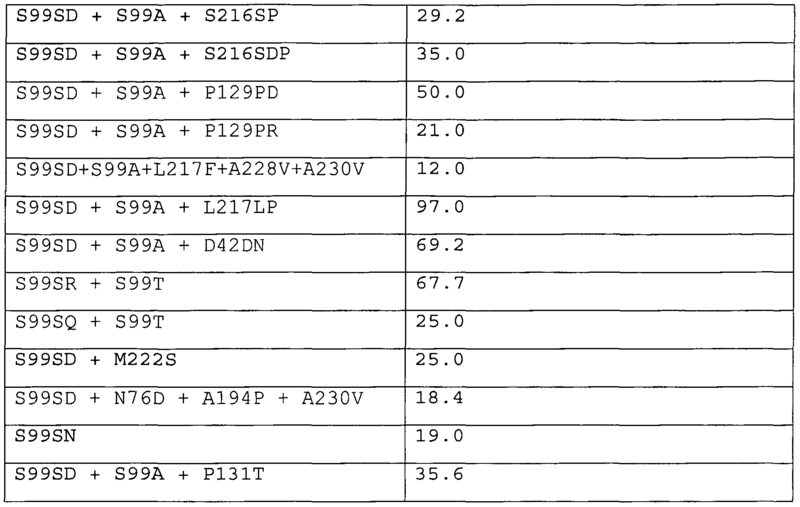 S101G+S103A+V104I+G159D-.A232V+Q236H+Q245R+N248D+N252K in combination with any one or more of the modification (s) mentioned above exhibit improved properties. Moreover, subtilase variants of the main aspect (s) of the invention are preferably combined with one or more modification (s) in any of the positions 129, 131 and 194, preferably as 129K, 131H and 194P modifications, and most preferably as P129K, P131H and A194P modifications. Any of those modification (s) are expected to provide a higher expression level of the subtilase variant in the production thereof. Thus, the "Ovo-inhibition Assay" disclosed in Example 4 herein may be employed to initially assess the potential of a selected variant. In other words, the "Ovo-inhibition Assay" may be employed to assess whether a selected variant will be inhibited, and to what extent, by the trypsin inhibitor type IV- 0. Using this test, the suitability of a selected variant to remove egg stains can be assessed, the rationale being that if a selected variant is strongly inhibited by trypsin inhibitor type IV- 0, it is normally not necessary to carry out further test experiments. Therefore, a variant which is particular interesting for the use described herein, is a variant which - when tested in the "Ovo- inhibition Assay" described in Example 4 herein - has a Residual Activity of at least 10%, e.g. at least 15%, such as at least 20%, preferably at least 25%, such as at least 30%, more preferably at least 35%. In a particular interesting embodiment of the invention, the variant has a Residual Activity of at least 40%, such as at least 45%, e.g. at least 50%, preferably at least 55%, such as at least 60%, more preferably at least 65%, such as at least 70%, even more preferably at least 75%, such as at least 80%, e.g. at least 90%, when tested in the "Ovo-inhibition Assay" described in Example 4 herein. Evidently, it is preferred that the variant of the invention fulfils the above criteria on at least the stated lowest level, more preferably at the stated intermediate level and most preferably on the stated highest level. 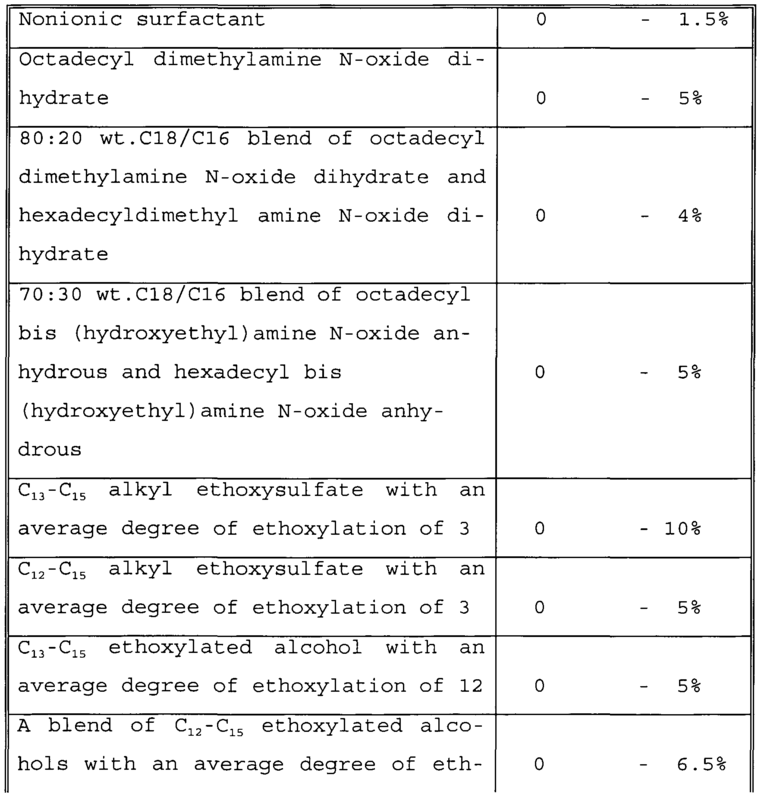 Alternatively, or in addition to the above-mentioned assay, the suitability of a selected variant may be tested in the "Model Detergent Wash Performance Test" disclosed in Example 3 herein. The "Model Detergent Wash Perfomance Test" may be employed to 36 assess the ability of a variant, when incorporated in a standard detergent composition, to remove egg stains from a standard textile as compared to a reference system, namely the parent subtilase (incorporated in the same model detergent system and tested under identical conditions) . Using this test, the suitability of a selected variant to remove egg stains can be initially investigated, the rationale being that if a selected variant does not show a significant improvement in the test compared to the parent subtilase, it is normally not necessary to carry out further test experiments. The improvement in the wash performance may be quantified by employing the so-called "Performance Factor" defined in Example 3, herein. In a very interesting embodiment of the invention, the variant of the invention, when tested in the "Wash Performance Test" has a Performance Factor of at least 1, such as at least 1.5, e.g. at least 2, preferably at least 2.5, such as at least 3, e.g. at least 3.5, in particular at least 4, such as at least 4.5, e.g. at least 5. Evidently, it is preferred that the variant of the invention fulfils the above criteria on at least the stated lowest level, more preferably at the stated intermediate level and most preferably on the stated highest level . As indicated above, the present invention also provides novel subtilase variants. It will be understood that details and par- ticulars concerning the novel subtilase variant aspects of the invention will be the same or analogous to the details and particulars of the variants discussed above in connection with the use aspect of the invention. This means that whenever appropriate, the statements concerning the use (e.g. preferred inser- tions and substitutions, etc.) discussed in detail herein, apply mutatis mutandis to the novel subtilase variants according to the invention as well as to the method aspect and the cleaning and detergent composition aspect of the invention. Many methods for cloning a subtilase and for introducing insertions into genes (e.g. subtilase genes) are well known in the 38 art, cf. the references cited in the "BACKGROUND OF THE INVENTION" section. In general standard procedures for cloning of genes and intro- ducing insertions (random and/or site directed) into said genes may be used in order to obtain a subtilase variant of the invention. For further description of suitable techniques reference is made to Examples herein ( vide infra) and (Sambrook et al . 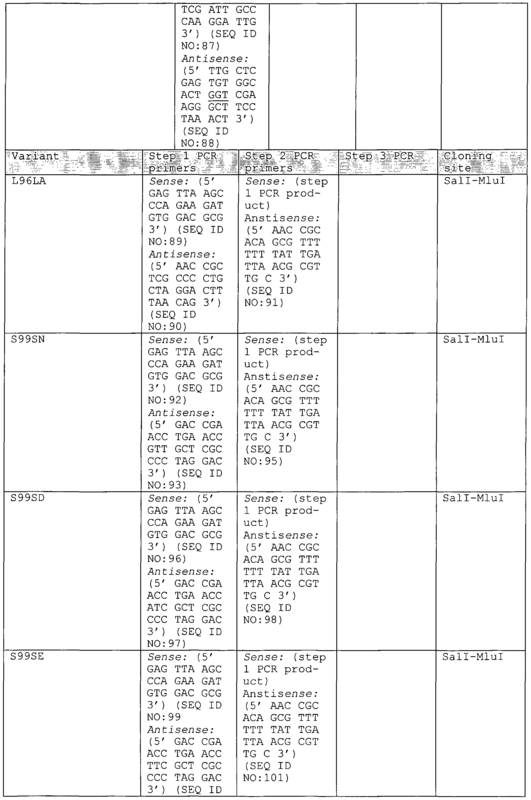 (1989) Molecular cloning: A laboratory manual, Cold Spring Har- bor lab., Cold Spring Harbor, NY; Ausubel, F. M. et al . (eds.) "Current protocols in Molecular Biology". John Wiley and Sons, 1995; Harwood, C. R. , and Cutting, S. M. (eds.) "Molecular Biological Methods for Bacillus". John Wiley and Sons, 1990); and WO 96/34946. Further, a subtilase variant may be constructed by standard techniques for artificial creation of diversity, such as by DNA shuffling of different subtilase genes (WO 95/22625; Stemmer WPC, Nature 370:389-91 (1994)). DNA shuffling of e.g. the gene encoding Savinase® with one or more partial subtilase sequences identified in nature to comprise an active site (b) loop regions longer than the active site (b) loop of Savinase®, will after subsequent screening for improved wash performance variants, provide subtilase variants suitable for the purposes described herein. A recombinant expression vector comprising a DNA construct encoding the enzyme of the invention may be any vector which may conveniently be subjected to recombinant DNA procedures. The choice of vector will often depend on the host cell into which it is to be introduced. Thus, the vector may be an 39 autonomously replicating vector, i.e. a vector which exists as an extrachromosomal entity, the replication of which is independent of chromosomal replication, e.g. a plasmid. Alternatively, the vector may be one that on introduction into a host cell is integrated into the host cell genome in part or in its entirety and replicated together with the chromosome (s) into which it has been integrated. The vector is preferably an expression vector in which the DNA sequence encoding the enzyme of the invention is operably linked to additional segments required for transcription of the DNA. In general, the expression vector is derived from plasmid or viral DNA, or may contain elements of both. The term, "operably linked" indicates that the segments are arranged so that they function in concert for their intended purposes, e.g. transcription initiates in a promoter and proceeds through the DNA sequence coding for the enzyme . The promoter may be any DNA sequence which shows transcriptional activity in the host cell of choice and may be derived from genes encoding proteins either homologous or heterologous to the host cell . The DNA sequence encoding the enzyme of the invention may also, if necessary, be operably connected to a suitable terminator. The recombinant vector of the invention may further comprise a DNA sequence enabling the vector to replicate in the host cell in question. The vector may also comprise a selectable marker, e.g. a gene the product of which complements a defect in the host cell, or a gene encoding resistance to e.g. antibiotics like kanamycin, chloramphenicol, erythromycin, tetracycline, spectinomycine, or the like, or resistance to heavy metals or herbicides. To direct an enzyme of the present invention into the secretory pathway of the host cells, a secretory signal sequence (also known as a leader sequence, prepro sequence or pre sequence) may be provided in the recombinant vector. The secretory signal sequence is joined to the DNA sequence encoding the enzyme in the correct reading frame. Secretory signal sequences are commonly positioned 5' to the DNA sequence encoding the enzyme. The secretory signal sequence may be that normally associated with the enzyme or may be from a gene encoding another secreted protein. The DNA sequence encoding the present enzyme introduced into the host cell may be either homologous or heterologous to the host in question. If homologous to the host cell, i.e. produced by the host cell in nature, it will typically be operably connected to another promoter sequence or, if applicable, another secretory signal sequence and/or terminator sequence than in its natural environment. The term "homologous" is intended to include a DNA sequence encoding an enzyme native to the host organism in question. The term "heterologous" is intended to include a DNA sequence not expressed by the host cell in nature. Thus, the DNA sequence may be from another organism, or it may be a synthetic sequence. The host cell into which the DNA construct or the recombinant vector of the invention is introduced may be any cell which is capable of producing the present enzyme and includes bacteria, yeast, fungi and higher eukaryotic cells including plants. Examples of bacterial host cells which, on cultivation, are capable of producing the enzyme of the invention are gram- positive bacteria such as strains of Bacillus, such as strains of B . subtilis , B . licheniformis, B . lentus , B . brevis, B . stearothermophilus , B . alkalophilus, B . amyloliquefaciens , B . coagulans, B . circulans, B . lautus, B . megatherium or B . thuringiensis, or strains of Streptomyces, such as S. lividans or S . murinus, or gram-negative bacteria such as Echerichia coli . The transformation of the bacteria may be effected by protoplast transformation, electroporation, conjugation, or by using 42 competent cells in a manner known per se (cf. Sambrook et al . , supra) . When expressing the enzyme in bacteria such as E. coli , the enzyme may be retained in the cytoplasm, typically as insoluble granules (known as inclusion bodies) , or may be directed to the periplasmic space by a bacterial secretion sequence. In the former case, the cells are lysed and the granules are recovered and denatured after which the enzyme is refolded by diluting the denaturing agent. In the latter case, the enzyme may be recovered from the periplasmic space by disrupting the cells, e.g. by sonication or osmotic shock, to release the contents of the periplasmic space and recovering the enzyme. Bacillus or Streptomyces strains, the enzyme may be retained in the cytoplasm, or may be directed to the extracellular medium by a bacterial secretion sequence. In the latter case, the enzyme may be recovered from the medium as described below. The present invention provides a method of producing an isolated enzyme according to the invention, wherein a suitable host cell, which has been transformed with a DNA sequence encoding the enzyme, is cultured under conditions permitting the production of the enzyme, and the resulting enzyme is recovered from the culture . Thereby it is possible to make a highly purified subtilase composition, characterized in being free from homologous impurities . In this context homologous impurities means any impurities (e.g, other polypeptides than the enzyme of the invention) which originate from the homologous cell where the enzyme of the invention is originally obtained from. The medium used to culture the transformed host cells may be any conventional medium suitable for growing the host cells in question. The expressed subtilase may conveniently be secreted into the culture medium and may be recovered therefrom by well- known procedures including separating the cells from the medium by centrifugation or filtration, precipitating proteinaceous components of the medium by means of a salt such as ammonium sulfate, followed by chromatographic procedures such as ion exchange chromatography, affinity chromatography, or the like. In general, cleaning and detergent compositions are well described in the art and reference is made to WO 96/34946; WO 97/07202; WO 95/30011 for further description of suitable cleaning and detergent compositions. Furthermore the examples herein demonstrate the improvements in wash performance on egg stains for a number of subtilase variants . The subtilase variant may be added to and thus become a component of a detergent composition. The detergent composition of the invention may for example be formulated as a hand or machine laundry detergent composition including a laundry additive composition suitable for pre- treatment of stained fabrics and a rinse added fabric softener composition, or be formulated as a detergent composition for use in general household hard surface cleaning operations, or be formulated for hand or machine dishwashing operations. In a specific aspect, the invention provides a detergent additive comprising a subtilase enzyme of the invention. The detergent additive as well as the detergent composition may comprise one or more other enzymes such as another protease, a lipase, a cutinase, an amylase, a carbohydrase, a cellulase, a pectinase, a mannanase, an arabinase, a galactanase, a xylanase, an oxi- dase, e.g., a laccase, and/or a peroxidase. In general the properties of the chosen enzyme (s) should be compatible with the selected detergent, (i.e. pH-optimum, compatibility with other enzymatic and non-enzymatic ingredients, etc. ), and the enzyme (s) should be present in effective amounts. Proteases : Suitable proteases include those of animal, vegetable or microbial origin. Microbial origin is preferred. Chemically modified or protein engineered mutants are included. The protease may be a serine protease or a metallo protease, preferably an alkaline microbial protease or a trypsin- like protease. Examples of alkaline proteases are subtilisins, especially those derived from Bacillus , e.g., subtilisin Novo, subtilisin Carlsberg, subtilisin 309, subtilisin 147 and 45 subtilisin 168 (described in WO 89/06279) . Examples of trypsin- like proteases are trypsin (e.g. of porcine or bovine origin) and the Fusarium protease described in WO 89/06270 and WO 94/25583. Examples of useful proteases are the variants described in WO 92/19729, WO 98/20115, WO 98/20116, and WO 98/34946, especially the variants with substitutions in one or more of the following positions: 27, 36, 57, 76, 87, 97, 101, 104, 120, 123, 167, 170, 194, 206, 218, 222, 224, 235 and 274. Preferred commercially available protease enzymes include Alcalase™, Savinase™, Primase™, Duralase™, Esperase™, and Kannase™ (Novo Nordisk A/S) , Maxatase™, Maxacal™, Maxapem™, Properase™, Purafect™, Purafect OxP™, FN2™, and FN3™ (Genencor International Inc.) . 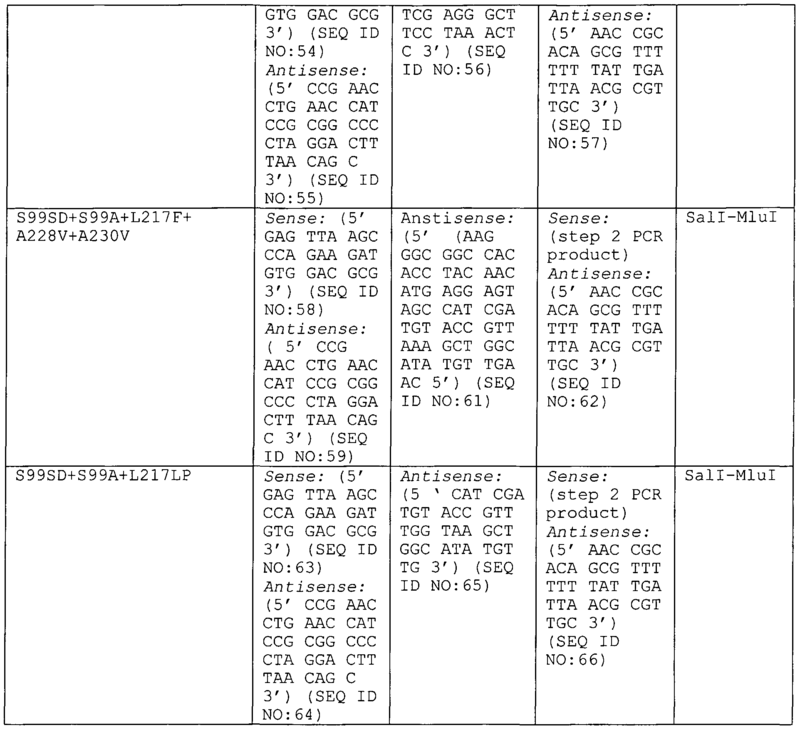 Other examples are lipase variants such as those described in WO 92/05249, WO 94/01541, EP 407 225, EP 260 105, WO 95/35381, WO 96/00292, WO 95/30744, WO 94/25578, WO 95/14783, WO 95/22615, WO 97/04079 and WO 97/07202. Preferred commercially available lipase enzymes include Lipolase™ and Lipolase Ultra™ (Novo Nordisk A/S) . Amylases : Suitable amylases (α and/or β) include those of bac- terial or fungal origin. Chemically modified or protein engineered mutants are included. Amylases include, for example, -amylases obtained from Bacillus, e.g. a special strain of B . licheniformis, described in more detail in GB 1,296,839. 94/02597, WO 94/18314, WO 96/23873, and WO 97/43424, especially the variants with substitutions in one or more of the following positions: 15, 23, 105, 106, 124, 128, 133, 154, 156, 181, 188, 190, 197, 202, 208, 209, 243, 264, 304, 305, 391, 408, and 444. Commercially available amylases are Duramyl™, Termamyl™, Fun- gamyl™ and BAN™ (Novo Nordisk A/S) , Rapidase™ and Purastar™ (from Genencor International Inc.) . Especially suitable cellulases are the alkaline or neutral cellulases having colour care benefits. Examples of such cellulases are cellulases described in EP 0 495 257, EP 0 531 372, WO 96/11262, WO 96/29397, WO 98/08940. Other examples are cellulase variants such as those described in WO 94/07998, EP 0 531 315, US 5,457,046, US 5,686,593, US 5,763,254, WO 95/24471, WO 98/12307 and PCT/DK98/00299. Commercially available cellulases include Celluzyme™, and Carezyme™ (Novo Nordisk A/S) , Clazinase™, and Puradax HA™ (Genencor International Inc.), and KAC-500(B)™ (Kao Corporation) . Peroxidases/Oxidases : Suitable peroxidases/oxidases include those of plant, bacterial or fungal origin. Chemically modified or protein engineered mutants are included. Examples of useful peroxidases include peroxidases from Coprinus , e.g. from C. cinereus, and variants thereof as those described in WO 93/24618, WO 95/10602, and WO 98/15257. Commercially available peroxidases include Guardzyme™ (Novo Nordisk A/S) . Non-dusting granulates may be produced, e.g., as disclosed in US 4,106,991 and 4,661,452 and may optionally be coated by methods known in the art. Examples of waxy coating materials are poly (ethylene oxide) products (polyethyleneglycol, PEG) with mean molar weights of 1000 to 20000; ethoxylated nonylphenols having from 16 to 50 ethylene oxide units; ethoxylated fatty alcohols in which the alcohol contains from 12 to 20 carbon atoms and in which there are 15 to 80 ethylene oxide units; fatty al- cohols; fatty acids; and mono- and di- and triglycerides of fatty acids. Examples of film-forming coating materials suitable for application by fluid bed techniques are given in GB 1483591. Liquid enzyme preparations may, for instance, be stabilized by adding a polyol such as propylene glycol, a sugar or sugar alco- hol, lactic acid or boric acid according to established methods. Protected enzymes may be prepared according to the method disclosed in EP 238,216. The detergent composition of the invention may be in any conven- ient form, e.g., a bar, a tablet, a powder, a granule, a paste or a liquid. A liquid detergent may be aqueous, typically containing up to 70% water and 0-30% organic solvent, or non- aqueous . The detergent composition typically comprises one or more surfactants, which may be non- ionic including semi -polar and/or anionic and/or cationic and/or zwitterionic. The surfactants are typically present at a level of from 0.1% to 60% by weight. When included therein the detergent will usually contain from about 1% to about 40% of an anionic surfactant such as linear alkylbenzenesulfonate, alpha-olefinsulfonate, alkyl sulfate (fatty alcohol sulfate) , alcohol ethoxysulfate, secondary al- 4 9 kanesulfonate, alpha-sulfo fatty acid methyl ester, alkyl- or alkenylsuccmic acid or soap. When included therein the detergent will usually contain from about 0.2% to about 40% of a non-ionic surfactant such as alcohol ethoxylate, nonylphenol ethoxylate, alkylpolyglycoside, al- kyldimethylamineoxide, ethoxylated fatty acid monoethanolamide, fatty acid monoethanolamide, polyhydroxy alkyl fatty acid amide, or N-acyl N-alkyl derivatives of glucosamine ( "glucamides" ) . The detergent may contain 0-65% of a detergent builder or com- plexing agent such as zeolite, diphosphate, triphosphate, phosphonate, carbonate, citrate, nitrilotriacetic acid, ethylenedia- minetetraacetic acid, diethylenetriaminepentaacetic acid, alkyl - or alkenylsuccmic acid, soluble silicates or layered silicates (e.g. SKS-6 from Hoechst) . The detergent may comprise one or more polymers. Examples are carboxymethylcellulose, poly (vinylpyrrolidone) , poly (ethylene glycol), poly(vinyl alcohol), poly (vinylpyridine-N-oxide) , poly (vinylimidazole) , polycarboxylates such as polyacrylates, maleic/acrylic acid copolymers and lauryl methacrylate/acrylic acid copolymers. The enzyme (s) of the detergent composition of the invention may be stabilized using conventional stabilizing agents, e.g., a polyol such as propylene glycol or glycerol, a sugar or sugar alcohol, lactic acid, boric acid, or a boric acid derivative, e.g., an aromatic borate ester, or a phenyl boronic acid derivative such as 4-formylphenyl boronic acid, and the composition may be formulated as described in e.g. WO 92/19709 and WO 92/19708. The detergent may also contain other conventional detergent ingredients such as e.g. fabric conditioners including clays, foam boosters, suds suppressors, anti -corrosion agents, soil- suspending agents, anti -soil redeposition agents, dyes, bacte- ricides, optical brighteners, hydrotropes, tarnish inhibitors, or perfumes. It is at present contemplated that in the detergent compositions any enzyme, in particular the enzyme of the invention, may be added in an amount corresponding to 0.01-100 mg of enzyme pro- tein per liter of wash liquor, preferably 0.05-5 mg of enzyme protein per liter of wash liquor, in particular 0.1-1 mg of enzyme protein per liter of wash liquor. The enzyme of the invention may additionally be incorporated in the detergent formulations disclosed in WO 97/07202 which is hereby incorporated as reference. XII: Automatic dishwashing compositions as described in I , II, III, IV, VI and X, wherein perborate is replaced by per- carbonate . XIII: Automatic dishwashing compositions as described in I-VI, which additionally contain a manganese catalyst. The manganese catalyst may, e.g., be one of the compounds described in "Efficient manganese catalysts for low-temperature bleaching", Nature, (1994), 369, 637-639. WFKION standard textile pieces (egg stains) were obtained from WFK Testgewebe GmbH, Christenfeld 10, D-41379 Brϋggen-Bracht , Germany . B . lentus 309 and 147 are specific strains of Bacillus lentus, deposited with the NCIB and accorded the accession numbers NCIB 10309 and 10147, and described in US Patent No. 3,723,250 incorporated by reference herein. E. coli MC 1000 (M.J. Casadaban and S.N. Cohen (1980); J. Moi . Biol . 138 179-207), was made r~,m+ by conventional methods and is also described in US Patent Application Serial No. 039,298. PLASMIDS: pJS3 (SEQ ID NO:60): E. coli - B . subtilis shuttle vector containing a synthetic gene encoding for subtilase 309 (Described by Jacob Schiødt et al . in Protein and Peptide letters 3:39-44 (1996)). pSX222 : B . subtilis expression vector (described in WO 96/34946) . 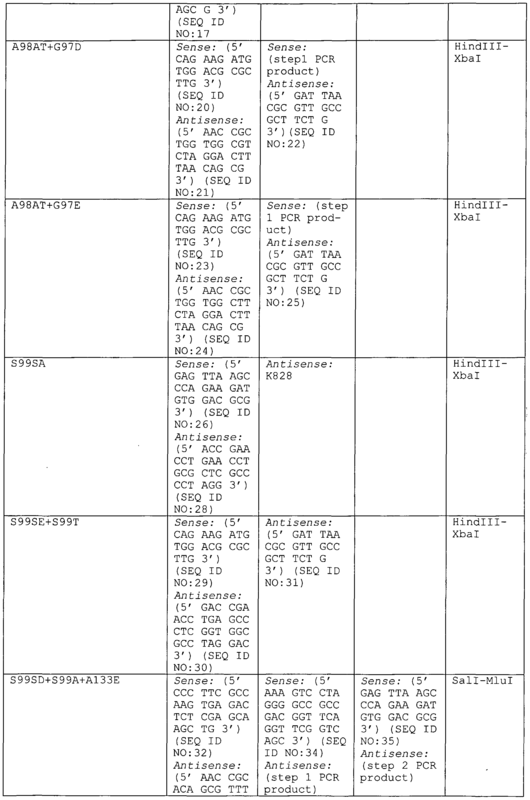 GENERAL MOLECULAR BIOLOGY METHODS: Unless otherwise mentioned the DNA manipulations and transformations were performed using standard methods of molecular biology (Sambrook et al . 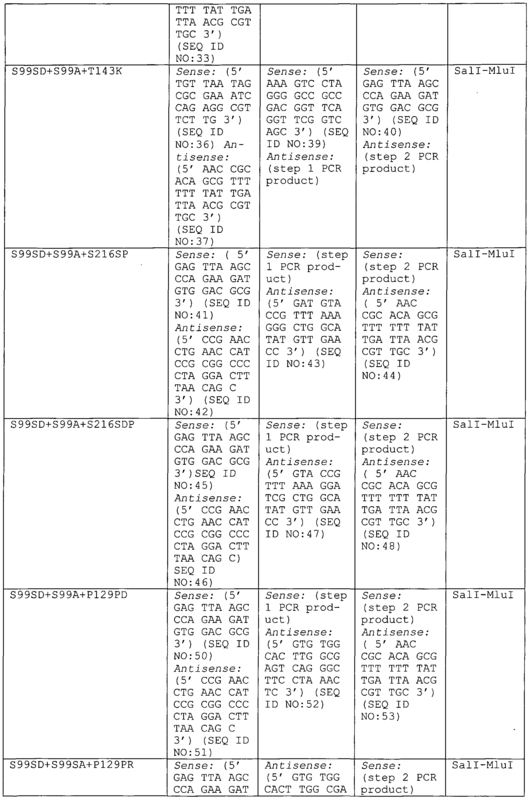 (1989) Molecular cloning: A laboratory manual, Cold Spring Harbor lab., Cold Spring Harbor, NY; Ausubel, F. M. et al . (eds.) "Current protocols in Molecular Biology". John Wiley and Sons, 1995; Harwood, C. R. , and Cutting, S. M. (eds.) "Molecular Biological Methods for Bacillus". John Wiley and Sons, 1990) . Enzymes for DNA manipulations were used according to the specifications of the suppliers. Unless otherwise mentioned all enzymes for DNA manipulations, such as e.g. restiction endonucleases, ligases etc., are obtained from New England Biolabs, Inc.
® determined relatively to an enzyme standard (SAVINASE ) , and the determination is based on the digestion of a dimethyl casein (DMC) solution by the proteolytic enzyme at standard conditions, i.e. 50°C, pH 8.3 , 9 min. reaction time, 3 min. measuring time. A folder AF 220/1 is available upon request to Novo Nordisk A/S, Denmark, which folder is hereby included by reference. A GU is a Glycine Unit, defined as the proteolytic enzyme activity which, under standard conditions, during a 15 minutes' incubation at 40°C, with N-acetyl casein as substrate, produces an amount of NH2-group equivalent to 1 mmole of glycine. Enzyme activity can also be measured using the PNA assay, according to reaction with the soluble substrate succinyl- alanine-alanine-proline-phenyl-alanine-para-nitro-phenol , which is described in the Journal of American Oil Chemists Society, Rothgeb, T.M., Goodlander, B.D., Garrison, P.H., and Smith, L.A. , (1988) . Consequently in order to make an e.g. 2 liter broth 20 Erlenmeyer flasks were fermented simultaneously. The starch in the medium is liquefied with α-amylase and the medium is sterilized by heating at 120°C for 45 minutes. 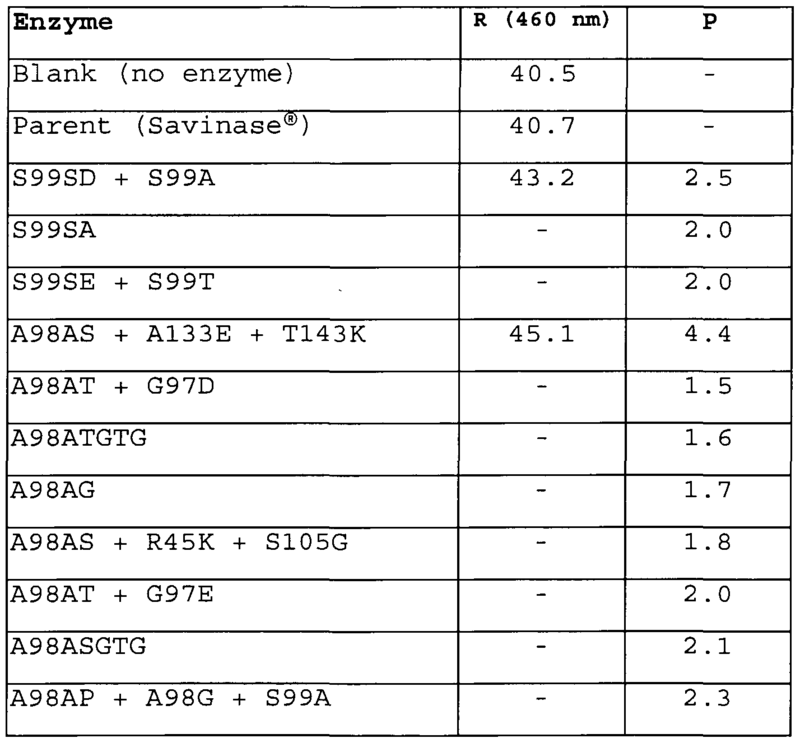 After sterilization the pH of the medium is adjusted to 9 by addition of NaHC03 to 0.1 M.
Subtilase 309 (savinase®) site-directed variants of the invention comprising specific insertions and comprising specific substitutions were made by traditional cloning of DNA fragments (Sambrook et al . 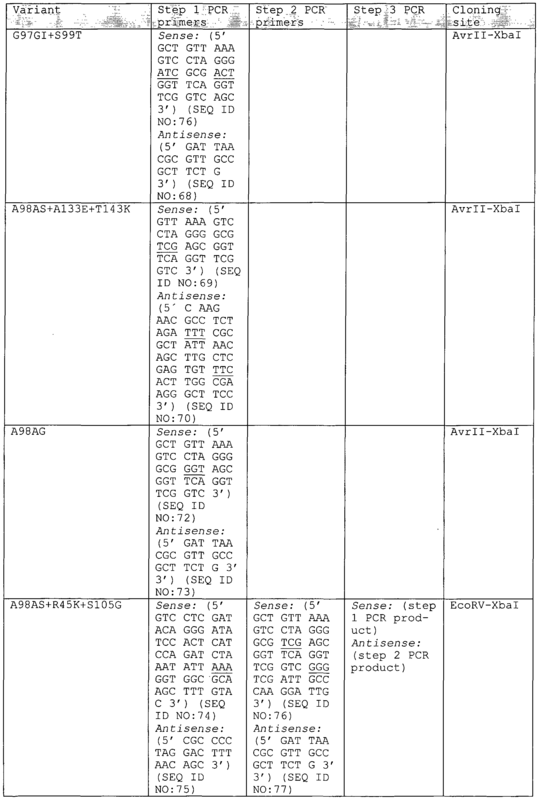 , Molecular Cloning: A Laboratory Manual, 2nd Ed., Cold Spring Harbor, 1989) produced by PCR with oligos containing the desired insertions (see below) . Insertions and substitutions were introduced by oligo directed mutagenesis to the construction of variants. The Subtilase 309 variants were transformed into E. coli . DNA purified from a over night culture of these transformants were transformed into B . subtilis by restriction endonuclease digestion, purification of DNA fragments, ligation, transformation of B. subtilis . Transformation of B. subtilis was performed as described by Dubnau et al . , 1971, J. Moi. Biol. 56, pp. 209- 221. Mutagenic primers (oligonucleotides) were synthesized corresponding to the DNA sequence flanking the sites of insertion and substitutions, separated by the DNA base pairs defining the insertions and substitutions. 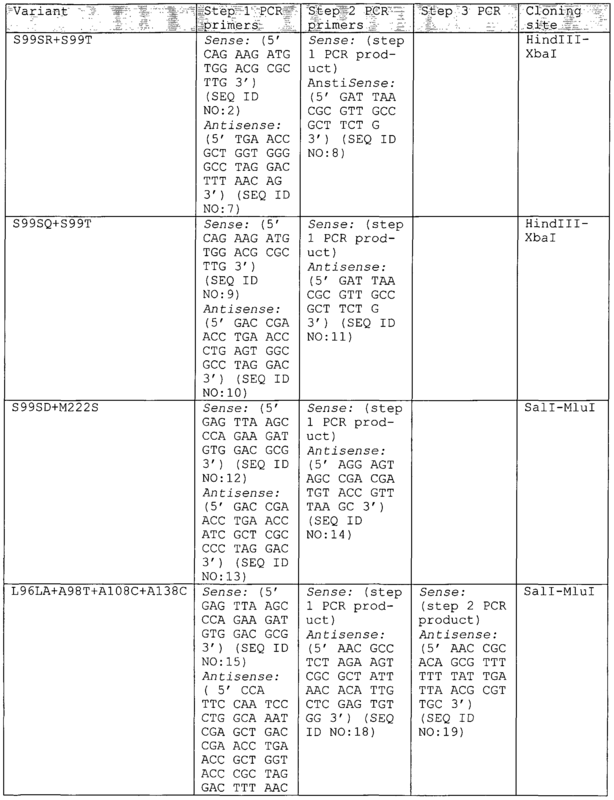 Subsequently, the resulting mutagenic primers were used in a PCR reaction with the modified plasmid pJS3 (see above) . The resulting PCR fragment was purified and extended in a second PCR-reaction, the resulting PCR product was purified and either cloned into the E. coli - B . subtilis shuttle vector (see below) or extended in a third PCR-reaction before being digested by endonucleases and cloned into the E. coli - B . subtilis shuttle vector (see below) . The PCR reactions are performed under normal conditions . Following this strategy insertions and substitutions was constructed in savinase® wherein insertions and substitutions 69 was introduced according to the below table. The primers used for each PCR step are shown as well as the cloning sites used. Two insertion and one substitution was constructed in savinase® wherein insertions was introduced in position 99 (*99aD) and 217 (*217aP) respectively and a substitution was introduced in position S99A (see below) . 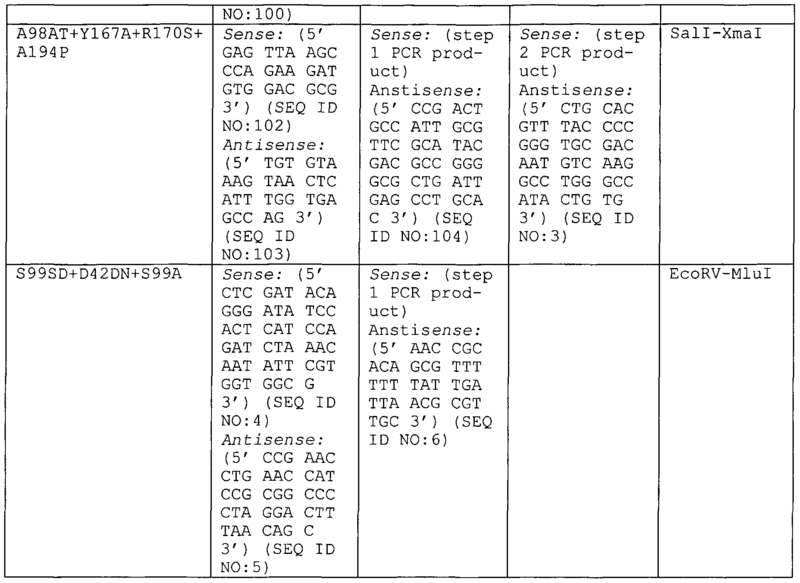 The insertion and substitution at position 99 was introduced by a mutagenic primer (5' CCG AAC CTG AAC CAT CCG CGG CCC CTA GGA CTT TAA CAG C 3' ( sense) ) (SEQ ID NO: 71) were used in a PCR reaction with an opposite primer (5' GAG TTA AGC CCA GAA GAT GTG GAC GCG 3' (antisense)) (SEQ ID NO:83) . The produced PCR fragment were extended towards the C-terminal of Savinase by a second round of PCR introducing the insertion at position 217 with primer; 5' CAT CGA TGT ACC GTT TGG TAA GCT GGC ATA TGT TG 3' (SEQ ID NO: 94) . The second round PCR product were extended towards the C-terminal of Savinase by a third round of PCR with primer; 5' AAC CGC ACA GCG TTT TTT TAT TGA TTA ACG CGT TGC 3' (SEQ ID NO.105), situated downstream at the Mlu I site in pJS3. All PCR reactions used plasmid pJS3 as template. The extended DNA- fragment resulting from third round PCR was cloned into the Sal I- and Mlu I- sites of the modified plasmid pJS3 (see above) . The plasmid DNA was transformed into E. coli by well-known techniques and one E. coli colony were sequenced to confirm the mutation designed. All other variants were constructed in an analogous manner. In order to purify a subtilase variant of the invention, the B . subtilis pJS3 expression plasmid comprising a variant of the 70 invention was transformed into a competent B . subtilis strain and was fermented as described above in a medium containing 10 μg/ml Chloramphenicol (CAM) . This procedure relates to purification of a 2 liter scale fermentation for the production of the subtilases of the invention in a Bacillus host cell. Approximately 1.6 liters of fermentation broth were centrifuged at 5000 rpm for 35 minutes in 1 liter beakers. The supernatants were adjusted to pH 6.5 using 10% acetic acid and filtered on Seitz Supra S100 filter plates. The filtrates were concentrated to approximately 400 ml using an A icon CH2A UF unit equipped with an Amicon S1Y10 UF cartridge. The UF concentrate was centrifuged and filtered prior to absorption at room temperature on a Bacitracin affinity column at pH 7. The protease was eluted from the Bacitracin column at 78 room temperature using 25% 2-propanol and 1 M sodium chloride in a buffer solution with 0.01 dimethylglutaric acid, 0.1 M boric acid and 0.002 M calcium chloride adjusted to pH 7. The fractions with protease activity from the Bacitracin purification step were combined and applied to a 750 ml Sephadex G25 column (5 cm dia.) equilibrated with a buffer containing 0.01 dimethylglutaric acid, 0.2 M boric acid and 0.002 m calcium chloride adjusted to pH 6.5. Fractions with proteolytic activity from the Sephadex G25 column were combined and applied to a 150 ml CM Sepharose CL 6B cation exchange column (5 cm dia.) equilibrated with a buffer containing 0.01 M dimethylglutaric acid, 0.2 M boric acid, and 0.002 M calcium chloride adjusted to pH 6.5. The protease was eluted using a linear gradient of 0-0.1 M sodium chloride in 2 litres of the same buffer (0-0.2 M sodium chloride in case of Subtilisin 147) . In a final purification step protease containing fractions from the CM Sepharose column were combined and concentrated in an Amicon ultrafiltration cell equipped with a GR81PP membrane (from the Danish Sugar Factories Inc.) . pH of the detergent solution is adjusted to 10.1 by addition of HCl or NaOH. Water hardness is adjusted to 15°dH by addition of CaCl2 and MGC12 (Ca2+:Mg2+ = 4:1) to the test system. After washing the textile pieces were flushed in tap water and air- dried. Germany) . The measurements are performed accordance with the manufacturer's protocol. In order to determine a blank value, a similar wash experiment is performed without addition of enzyme. The subsequent measurement of the reflectance (Rbιank) is performed as described right above . As it appears, the subtilase variants exhibit improved wash performance on egg stains in comparison to the parent subtilase, i.e. Savinase . The below inhibition assay is based on the principle that the subtilase variant to be tested will catalyse the hydrolysis of a peptide-pNA bond, thereby releasing the yellow pNA, which may conveniently be followed at 405 nm. The amount of released pNA after a given period of time is a direct measure of the subtilase activity. By carrying out such hydrolysis experiments with and without inhibitor, respectively, it is possible to obtain a quantitative measure for the degree to which a certain subtilase variant is inhibited. Substrate solution (2 mM) : 500 mg Suc-Ala-Ala-Pro-Phe-pNA is dissolved in 4 ml DMSO (200 mM) . This solution is diluted 100 times with the buffer solution described below. The concentration of substrate in the resulting substrate solution is 2 mM. Enzyme solution (0.001 mg/ml) : 1 mg enzyme is dissolved in 10 ml water. This solution is dissolved 100 times with the buffer solution described below. The concentration of enzyme in the resulting enzyme solution is 0.001 mg/ml. Buffer solution (pH 8.6) : 15.7 mg Tris is dissolved in an appropriate amount of water and 0.75 ml 30% (w/v) BRIJ (BRIJ 35 poly- oxyethylenelaurylether, 30% (w/v), Sigma Cat. No. 430AG-6) is added. The pH is adjusted to 8.6 with 4 M NaOH and the solution is diluted to 1 liter with water. 1 volume unit (e.g. 80 μl) inhibitor solution is mixed with 1 volume unit (e.g. 80 μl) enzyme solution in an appropriate reac- tion vessel (e.g. a spectrophotometer cell or a micro titer plate) and equilibrated at 25°C for 15 min. 1.375 volume units (e.g. 110 μl) substrate solution is added to the reaction vessel after which the absorbance at 405 nm is followed for 11 min (e.g. by measuring every 10th or 30th second) . The slope of the absorbance curve is calculated using linear regression analysis. The slope of the absorbance curve is denoted αinhibltor. 1 volume unit (e.g. 80 μl) buffer solution is mixed with 1 vol- ume unit (e.g. 80 μl) enzyme solution in an appropriate reaction vessel (e.g. a spectrophotometer cell or a micro titer plate) and equilibrated at 25°C for 15 min. 1.375 volume units (e.g. 110 μl) substrate solution is added to the reaction vessel after which the absorbance at 405 nm is followed for 11 min (e.g. by measuring every 10th or 30th second) . The slope of the absorbance 85 curve is calculated using linear regression analysis. The slope of the absorbance curve is denoted α. 1 volume unit (e.g. 80 μl) inhibitor solution is mixed with 1 volume unit (e.g. 80 μl) buffer solution in an appropriate reaction vessel (e.g. a spectrophotometer cell or a micro titer plate) and equilibrated at 25°C for 15 min. 1.375 volume units (e.g. 110 μl) substrate solution is added to the reaction vessel after which the absorbance at 405 nm is followed for 11 min. These measurements are not used in the calculations, but merely serve as a control that no enzyme has been added to the buffer and/or substrate solution. As it appears, the subtilase variants were inhibited to a much smaller extent than the parent subtilase, i.e. savinase*. The performance of the variant of the invention in ADW was tested in a commercial available household dishwash composition (Somat Turbo, from Henkel Washmittel GmbH) using standard conditions. The soil used was an egg/milk mixture coated on a steel plate. Further, a ballast soil containing various foodstuffs was added. The Somat Turbo dishwash composition was heated at 85°C for 5 minutes in a microwave oven in order to inactivate enzyme activity in the composition. 220 ml full cream milk was mixed with 15 raw eggs in a Braun UK 20 kitchen machine for 2 minutes, After sieving, stainless steel plates were soiled in the mixture by immersion. The plates were dried overnight at room temperature in an upright position. The dried plates were then heated at 120°C for 45 minutes in order to denature the proteins on the surface. Potato starch (5.43%), wheat flour (4.38%), vegetable oil (4.32%), margarine (4.32%), lard (4.32%), cream (8.76%), full cream milk (8.76%), eggs (8.76%), tomato ketchup (3.00%), barbecue sauce (2.19%), mustard (4.00%), benzoic acid (0.73%), water (3 mM Ca2+ + Mg2+) (36.71%). The detergent used was obtained from supermarket in Germany (Persil Megapearls) . Prior to use all enzymatic activity was in the detergents were inactivated by microwave treatment (5 minutes, 85°C) . The reflectance measurements were performed as described in Example 3 herein. A variant having a higher R-value than savinase® was given the value 1. A variant having a lower R-value than savinase® was given the value -1. 1. Use of a subtilase variant for removal of egg stains from laundry or from hard surfaces, the subtilase variant coπprising at least one addi- tional amino acid residue in the active site loop (b) region from position 95 to 103 (BASBPN numbering) . 2 . Use according to claim 1 , wherein the additional amino acid residue has been inserted in a position selected from the group consisting of : between positions 95 and 96, between positions 96 and 97, between positions 97 and 98, between positions 98 and 99, between positions 99 and 100 , between positions 100 and 101, between positions 101 and 102 , between positions 102 and 103 , between position 103 and 104 and combinations thereof . 3. Use according to claim 2, wherein the additional amino acid residue has been inserted in a position selected from the group consisting of : between positions 98 and 99 and between positions 99 and 100. 4 . Use according to any of claims 1 - 3 , where the variant - when tested in the "Ovo- inhibition Assay" disclosed in Example 4 herein - has a Residual Activity of at least 10% , such as at least 15% , preferably at least 20% , more preferably at least 25% . 5. Use according to any of claims 1-4 , wherein the insertion between positions 98 and 99 is selected from the group consisting of X98XA, X98XT, X98XG and X98XS . 7. Use according to any of the preceding claims, wherein the variant comprises at least one further modification. 8. Use according to claim 7, wherein the further modification is performed in a position selected from the group consisting of: substitution in position 99, substitution in position 133, substitution in position 143, substitution in position 167, substitution in position 170, substitution in position 194, insertion between positions 42 and 43, insertion between positions 129 and 130, insertion between positions 216 and 217, insertion between 217 and 218, and combinations thereof. a variant coπprising an insertion of at least one additional amino acid residue between positions 99 and 100 and further coπprising an insertion of at least one additional amino acid residue between positions 129 and 130. 10. Use according to any of the preceding claims, wherein the parent subtilase belongs to the sub-group I-Sl. 11. Use according to claim 10, wherein the parent subtilase is selected from the group consisting of BSS168, BASBPN, BSSDY, and BLSCAR, or functional variants thereof having retained the characteristic of sub-group I-Sl. 12. Use according to any of claims 1-9, wherein the parent subtilase belongs to the sub-group I-S2. 14. Use according to claim 13, wherein the parent subtilase is BLSAVI (SEQ ID NO: 1) . 15. Use according to claim 14, wherein the variant is S99SD + S99A. 16. Use according to claim 14, wherein the variant is S99SR + S99T. 17. Use according to claim 14, wherein the variant is A98AS + A133E + T143K. 18. Use according to claim 14, wherein the variant is A98AT + Y167A 4- R170S + A194P. 19. Use according to claim 14, wherein the variant is S99SD + S99A + P129PD. 20. Use according to claim 14, wherein the variant is S99SD + S99A + S216SP. 21. Use according to claim 14, wherein the variant is S99SD + S99A + S216SDP. 22. Use according to claim 14, wherein the variant is S99SD + S99SA + L217LP. 23. Use according to claim 14, wherein the variant is S99SD + D42DN. where the variant - when tested in the "Ovo-inhibition Assay" dis- closed in Example 4 herein - has a Residual Activity of at least 10%. 26. The variant according to claim 25, where the variant has a Residual Activity of at least 15%, preferably at least 20%, more preferably at least 25%. 28. A subtilase variant as defined in any of claims 9-24. 29. An isolated DNA sequence encoding a subtilase variant as defined in any of claims 25-28. 31. A microbial host cell transformed with the expression vector of claim 30. 32. A microbial host cell according to claim 31, which is a bacterium, preferably a Bacillus, especially a B. lentus. 33. A microbial host cell according to claim 31, which is a fungus or yeast, preferably a filamentous fungus, especially an Aspergillus . 34. A method for producing a subtilase variant according to any of claims 25-27, wherein a host according to any claims 31-33 is cultured under conditions conducive to the expression and secretion of said variant, and the variant is recovered. 35 . A cleaning or detergent composition, preferably a laundry or dishwash composition, comprising the variant according to any of claims 25 -28 . 36 . A composition according to claim 35 , which additionally comprises a cellulase , a lipase , a cutinase , an oxidoreductase , another protease , an amylase or a mixture thereof . 37 . Use of a variant as defined in any of claims 25 -28 in a cleaning or detergent composition, preferably a laundry and/or a dishwash composition . 38 . A method for removal of egg stains from a hard surface or from laundry, the method comprising contacting the egg stain- containing hard surface or the egg stain-containing laundry with a cleaning or detergent composition , preferably a laundry or dishwash composition, containing a subtilase variant comprising 98 at least one additional amino acid residue in the active site loop (b) region from position 95 to 103 (BASBPN numbering) . 39. A method according to claim 38, wherein the variant has the characteristics as defined in any of claims 2-24. 40. A method according to any of claims 38-39, wherein the composition additionally comprises a cellulase, a lipase, a cutinase, an oxidoreductase, another protease, an amylase or a mixture thereof . 41. Use of a cleaning or detergent composition, preferably a laundry or dishwash composition, containing a subtilase variant comprising at least one additional amino acid residue in the active site loop (b) region from position 95 to 103 (BASBPN numbering) for removal of egg stains from laundry or from hard surfaces. 42. Use according to claim 41, wherein the variant has the characteristics as defined in any of claims 2-24. 43. Use according to any of claims 41-42, wherein the composition additionally comprises a cellulase, a lipase, a cutinase, an oxidoreductase, another protease, an amylase or a mixture thereof . ES2227508T3 (en) * 1989-06-26 2005-04-01 Unilever N.V. enzymatic detergent compositions. ES2275265T3 (en) 2007-06-01 Subtilisin BPN variants with reduced adsorption and improved hydrolysis. MXPA02009920A (en) 2003-03-27 Macrocyclic ns3 serine protease inhibitors of hepatitis c virus comprising n cyclic p2 moieties. ES2273417T3 (en) 2007-05-01 Protease enzymes to remove tough dirt and / or reduce the formation of spots and movies and composciciones that incorporate.